Within 10 days in July 2018, three full-time CPT workers were denied entry into Palestine by Israeli immigration. Carter, 24 years old, from United States, asked the Israeli soldier who was questioning him at the border if he was a threat, as a CPTer who holds the Israeli military to account under international law and its own national laws. The Israeli sergeant stated that “CPT is a leech.” The soldier threatened that no CPTers will ever pass through Israeli immigration again and that CPT will die as an organization. After six hours at the Israeli occupying border, Carter was denied entry for 15 years and sent back to Jordan. Joyce, 29 years old, from United States, landed at Ben Gurion Airport in Tel Aviv, late in the morning and after several interrogations she was held overnight in a cell with seven other women prior to deportation. After more than 20¬ hours, Joyce was deported from the airport and put on a plane to Canada. Jane, 24 years old, from Australia, was questioned twice by immigration and interrogated a third time by a soldier and an immigration worker for 40 minutes. 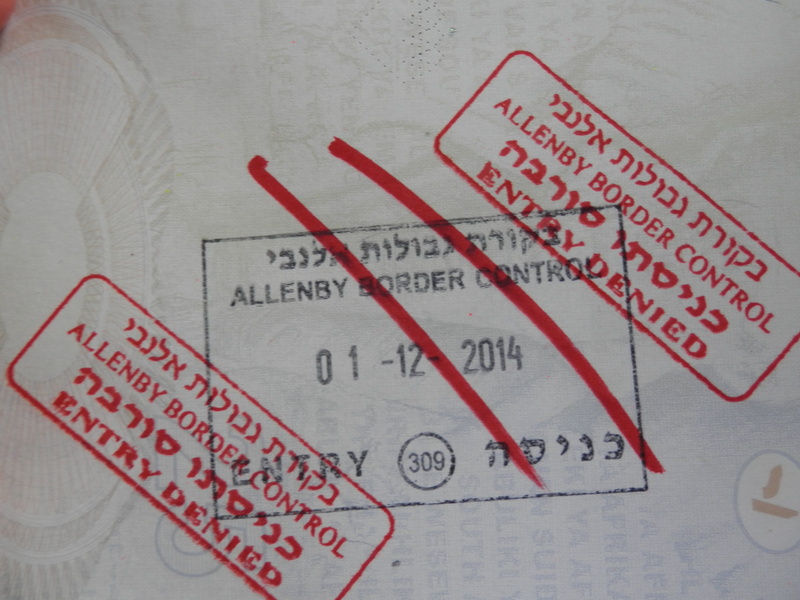 After nine hours at Allenby border, Jane was denied entry and sent back to Jordan. For the three CPTers it was clear at the beginning of their interrogations that the immigration officials knew of their work with CPT and for this reason they would be denied entry. Why? For being associated with an organization which works alongside of and is led by Palestinian nonviolent organizations and activists striving for a peaceful future. These denials have several repercussions. Due to three denials, CPT could not staff an operating team for two weeks, resulting in one less ally on the ground to witness to and document the daily human rights abuses against Palestinians. For the community of al-Khalil/Hebron, it is another moment when their power and voices are spoken over and ignored, as they are unable to welcome CPT as their partner organization into their own community. Palestinians continuously feel the stranglehold on their voices and their rights under international law denied, and the denial of their right to self-determination and freedom. Personally, the experience of denial is difficult for the individual CPTers, who had planned to spend another three to six months in al-Khalil, continuing their commitment to the community. The denial of human rights workers and supporters of Palestine is increasing. At the time of writing, two more CPTers were interrogated and denied entry by Israel. In total, five CPTers were denied entry in a little over a month. In January 2018 the Israeli parliament passed new laws stating that any foreigner entering “Israel” could be denied entry into the country if any link is found between them and the BDS (boycott, divestment, and sanctions) Movement. Currently, a bill in the Knesset is trying to make it illegal for anyone to photograph or record Israeli military personnel and police. Foreigners are being denied entry for supporting Palestine and for being part of a nonviolent campaign based on ethics and morality. If Israel has nothing to hide, then what is it so afraid of?